Build Your Own armed Drones! Yesterday Boing Boing linked to a Northeastern University engineering students’ drone that honed in on radio signals. Today we see the next step, arming those drones. In this commercial for a cell phone screen protector product, a quadcopter flies up to some fruit, sodas and a cell phone and shoots them with a remote controlled handgun. The company, Clearplex, has many videos of its screen protector products being shot at, so this one is a natural, although creepy, extension of that series. The video is edited so it’s hard to know how accurate the quad-copter is, but consider how apparently easy creating this one was, what’s the next step? Be the first on your block to make one! After posting this I decided to follow up with the company and sent this email to them. I recently wrote about your video, Drones Vs. 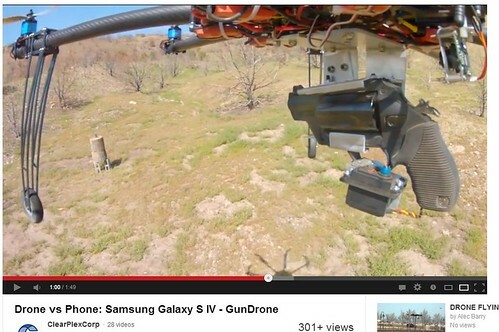 Phones Samsung Galaxy S IV – GunDrone for the blog FireDogLake , for my blog Spocko’s Brain after seeing it at the science fiction and science blog io9.com. I’m curious why you chose to use an armed quadcopter to illustrate the protective properties of your screen protector. I’m also interested in the greater implications of people making their own armed drones in the United States. Did you follow any plans to create this drone, or did you figure it out yourself? Will you be publishing how you built this drone? What devices did you use to control the drone and the camera/phone attached to it? How close/far away were you from the quadcopter while controlling it? Were you using a cell phone connection, and RF controller, wifi or a combination of them. Some people have noted that the video was edited and it did not show an angle where you could see the drone handgun fire and actually hit the object. Is this because it never happened or because of simple editing choices? Were there issues controlling the drone and aiming the gun? How many people were involved? Were there separate individuals, one for the gun, one for the pilot and one for the camera mounted on the quadcopter? I’m also curious about your political views. Do you have an opinion on police or the federal government using armed drones in the US? What about using them in other countries? Do you think that people who create homemade armed drones should be licensed? Should the FAA issue rulings on armed drones in the US? Has anyone from the military contacted you about this? What kind of questions did they have for you? Are you concerned that you now might be on a terrorist watch list? Finally, I understand that this video is intended to be a sales tool. Has it worked? Have you received a lot of orders for your product or more inquires about how to build it or where to buy the one?